Finger Millet , also known as Ragi or Nachni, is considered one of the most nutritious cereals available today. It is a rich source of calcium, iron, protein, fiber and other minerals. 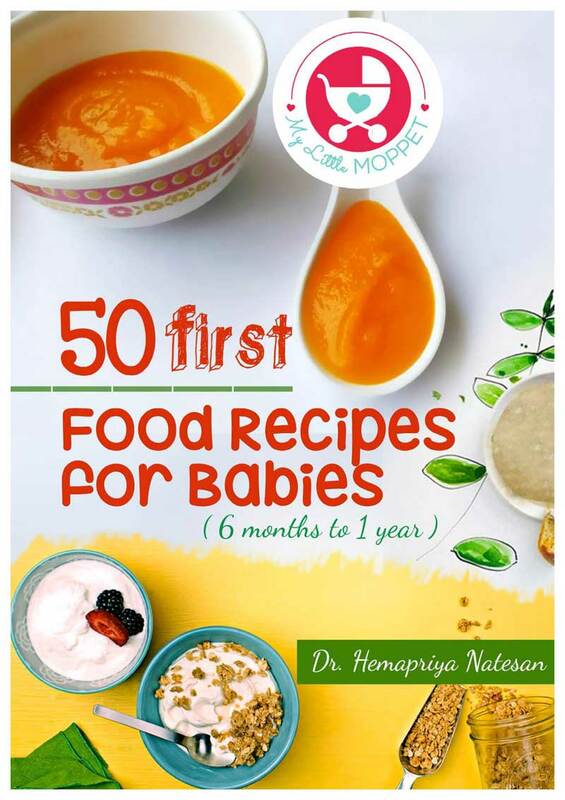 If your kids are bored of Ragi porridge, don’t worry! 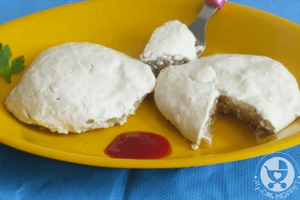 There are several other ways to feed your kids ragi, like Ragi Dosa, Ragi Idli and Ragi Cookies. 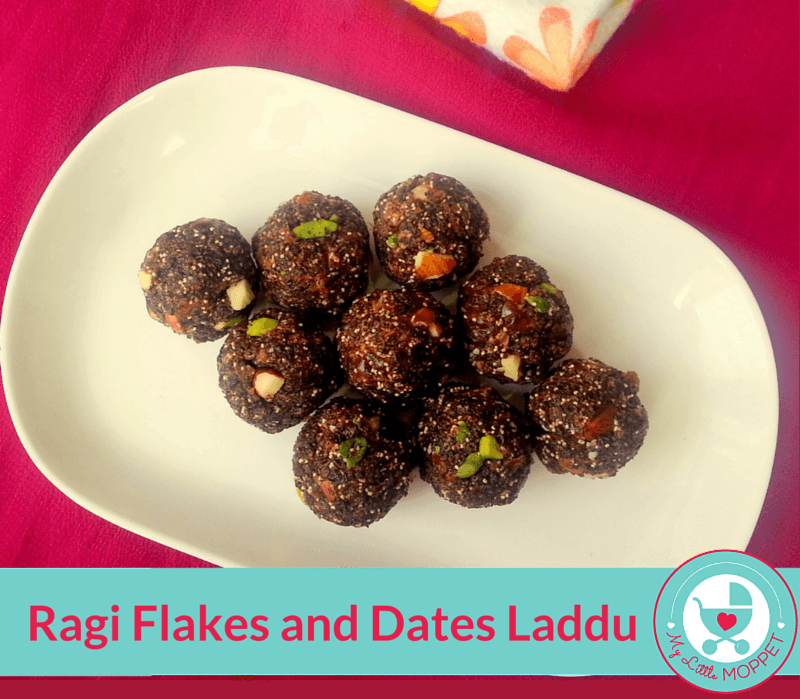 Today, however, we have a sweet treat that is made with 100% Organic Ragi/Finger Millet Flakes from Little Moppet Foods – Ragi Flakes and Dates Laddu. 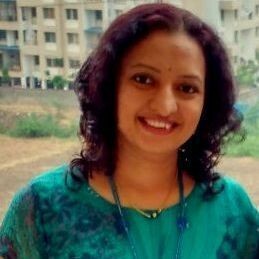 Now everyone’s going to be looking for an excuse to eat Ragi!! 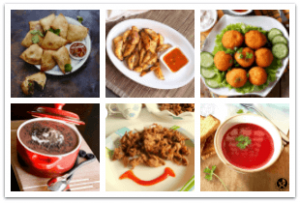 The recipe uses Ragi flakes and fresh palm dates as the main ingredients. 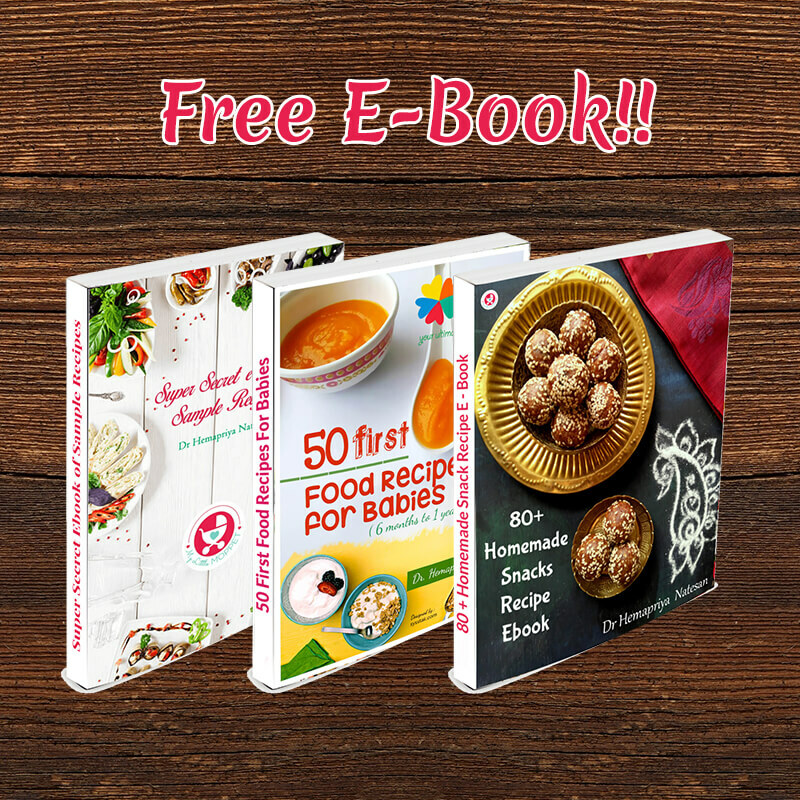 Poppy seeds and nuts offer a nice nutty flavor and add on to the nutritional value of these laddus. 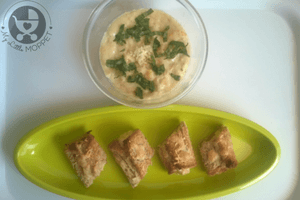 The dates also serve as a natural sweetener and hence no additional sugar is used in this recipe. 1. 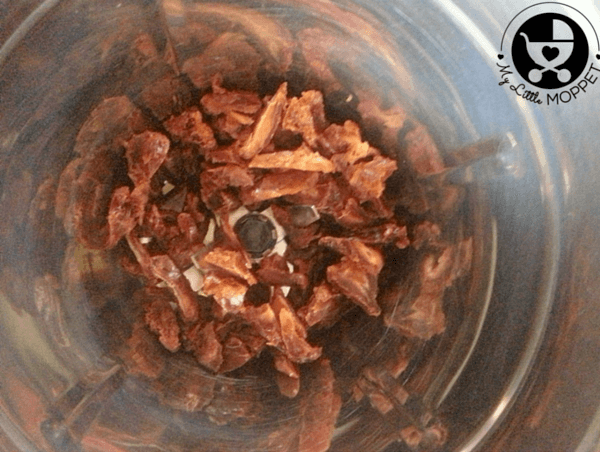 Chop the dates roughly and using a food processor or grinder, pulse the dates in small batches. This will make small bits and save you the time and effort of individually chopping the dates. 2. In a wok, dry roast the Almonds and Pistachios and chop them roughly. Keep aside. Heat 1 tbsp of ghee and roast the Ragi flakes on low flame until crispy. 3. 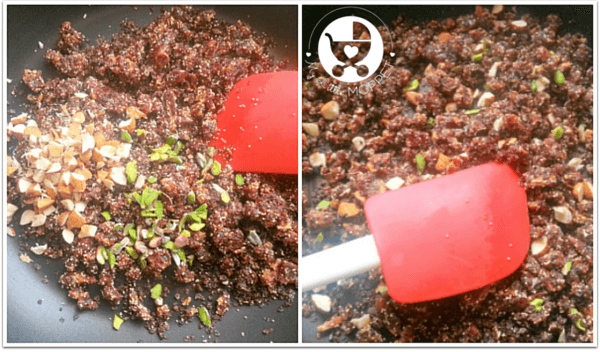 To the roasted ragi flakes, add the date bits and poppy seeds. Mix everything together and roast gain for another 1-2 minutes. 4. Finally, add the roasted and chopped nuts and mix well. Turn off the flame. 5. Let the mixture rest till it’s cool enough to handle with your bare hands. 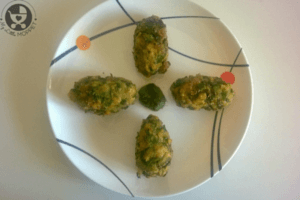 Pinch out a small portion from the laddu mixture and roll it into a round ball. Repeat till all the mixture is used up. 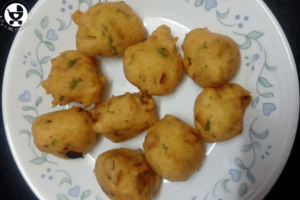 You can make big or small bite size laddus as per your choice. The above mixture yields 8-10 medium sized ladoos. 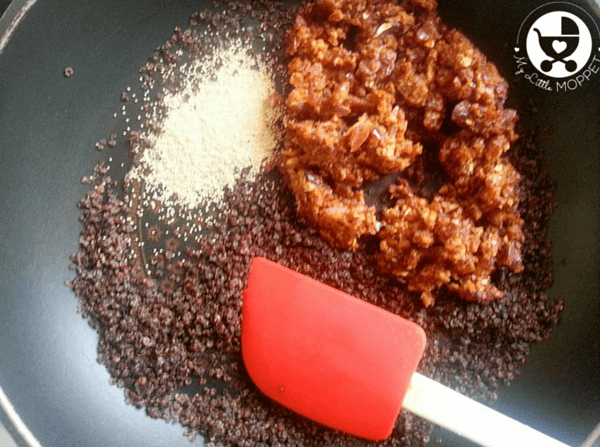 If you want a smooth texture to the laddus, after roasting the ragi flakes in step 2 , you can grind it to powder and use that powder directly for the laddus. 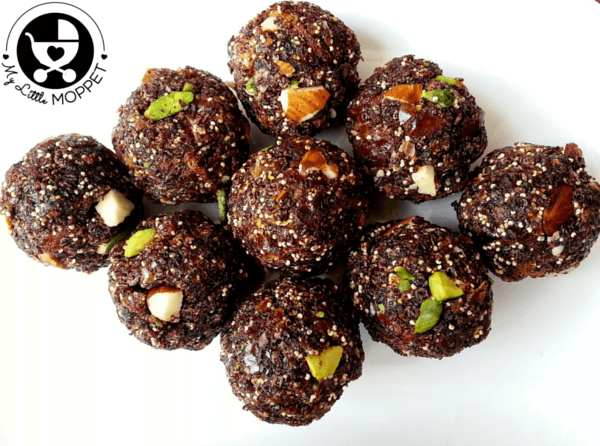 These Finger Millet Flakes and Dates Laddus are great as an after dinner sweet, a snack and are also great for a delicious , healthy and nutritious breakfast! These are also excellent as healthy substitutes for traditional festive sweets.  They’re quick to make and use no harmful ingredients – perfect for the entire family! 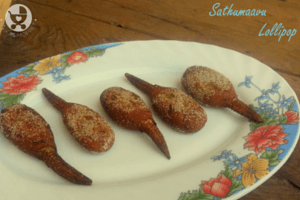 Ragi or Finger Millet is an incredibly healthy food, but plain old ragi porridge can get boring! 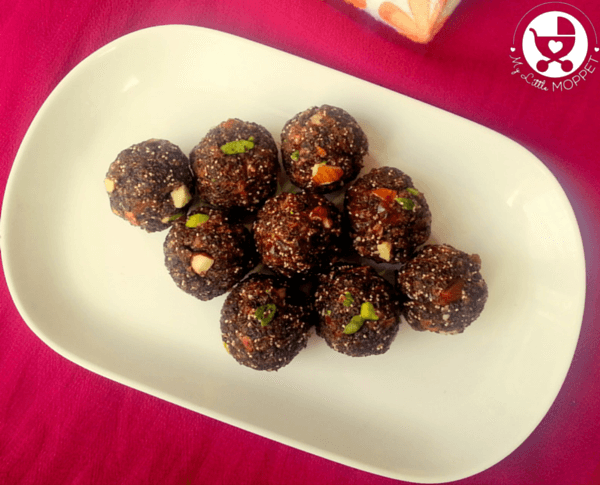 Make things interesting with these yummy and nutritious Ragi Flakes and Dates Laddus! Chop the dates roughly and using a food processor or grinder, pulse the dates in small batches. This will make small bits and save you the time and effort of individually chopping the dates. In a wok, dry roast the Almonds and Pistachios and chop them roughly. Keep aside. Heat 1 tbsp of ghee and roast the Ragi flakes on low flame until crispy. 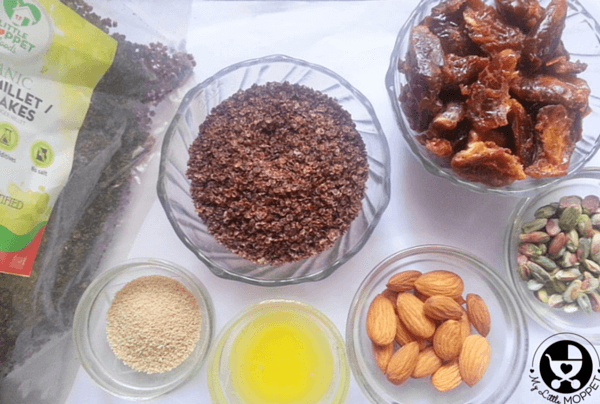 To the roasted ragi flakes, add the date bits and poppy seeds. Mix everything together and roast gain for another 1-2 minutes. Finally, add the roasted and chopped nuts and mix well. Turn off the flame. Let the mixture rest till it's cool enough to handle with your bare hands. 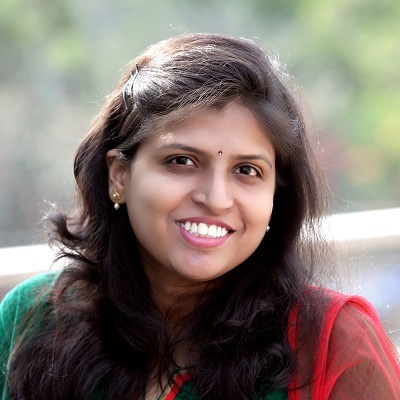 Pinch out a small portion from the laddu mixture and roll it into a round ball. Repeat till all the mixture is used up. 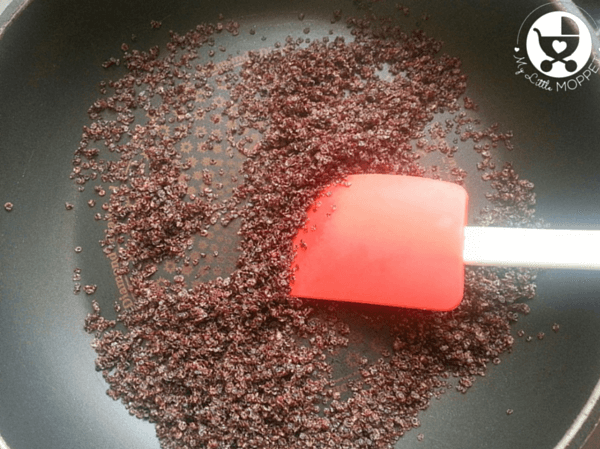 instead of ragi flakes, is it possible to use ragi flour ?